48th Divisional Ammunition Column, Royal Field Artillery, 48th Division, T.F., B.E.F. Archibald Garbutt, was born at Cradley in 1886, the son of Charles, a bricklayer’s foreman, and Livinia Garbutt (who later lived at 10, Laundry Cottages, Yates Hay Road, Upper Howsell). He was the eldest of the family, having four younger sisters. 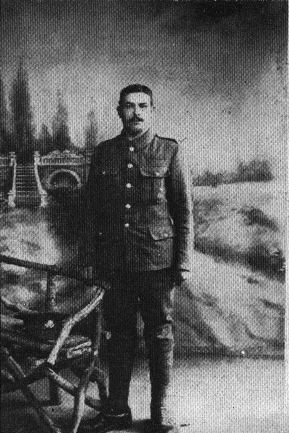 Dvr Garbutt joined the South Midland Territorial Artillery on active service on 26 November 1915. Until May 1916 he served with the 2nd Brigade Ammunition Column (BAC) which was responsible for keeping the Artillery Brigade supplied with ammunition and had been based at Malvern before the War. On 15 May 1916 the three BACs of the Division were merged to form a Divisional Ammunition Column (DAC).